Patch 1.05 increases game difficulty. Patch 1.05 (alternative link 1) (alternative link 2) - Last patch for the game. Resolves a number of issues, including higher difficulty on "hard" setting. The changelog can be found here. 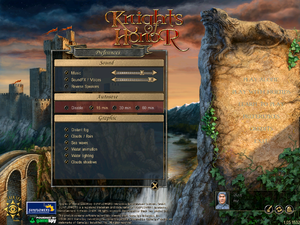 Download Knights of Honor blank intros. Install the patch to your root folder <path-to-game> and pick one of 3 supported resolutions during installation. 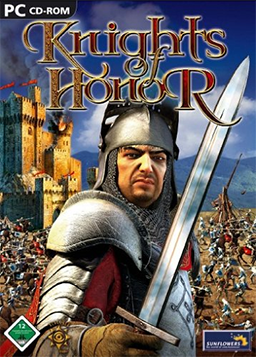 Go to %APPDATA%\Black Sea Studios\Knights Of Honor. Open KoH.in2 (it is recommended to use a program like Notepad++). Change the width and height to whatever you want. Now open the game. It will pop up with the setup screen. Go though the different video settings testing each until you find the one that fills your screen. Select it each time you start the game for it to be widescreen. Only 2 sliders: "Music" and "Sound/Voices"
Start the game, hold down ⇧ Shift and click "CREDITS" in main menu (above "EXIT" button). ↑ 1.0 1.1 File/folder structure within this directory reflects the path(s) listed for Windows and/or Steam game data (use Wine regedit to access Windows registry paths). Games with Steam Cloud support may store data in ~/.steam/steam/userdata/<user-id>/25830/ in addition to or instead of this directory. The app ID (25830) may differ in some cases. Treat backslashes as forward slashes. See the glossary page for details. This page was last edited on 1 April 2019, at 00:21.